Concrete Scanning NY NJ CT PA | Utility Survey Corp.
Before you excavate, trench or drill call US! Concerned about utilities, post-tension cables and other objects within concrete structures prior to drilling, coring, or saw cutting? Our experts in ground penetrating radar (GPR) scanning can help you! 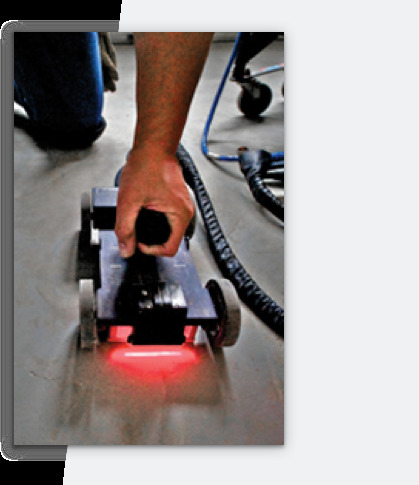 Due to its advantages over X-Ray, GPR has emerged as an alternative way of non-destructive concrete testing. Utility Survey Corp. uses a variety of high frequency GPR antennas that allow the operator to balance between the resolution and the penetration depth. It enables us to better detect embedded conduits, post-tension cables, rebar, wire mesh and other objects with varieties of sizes, depths and materials. In addition to GPR, we also utilize state-of- art pipe/cable locators with Cable Avoidance Technology (C.A.T.) for additional safety measures. It has been proven to be very effective in finding PVC conduits and even direct buried electrical/communication cables, which are generally more difficult than steel conduits for GPR to detect. Whether to validate reinforcement or locate utilities embedded in and below concrete structures, give us a call! How is Concrete Structure Scanning done? Damaging a utility can have potentially costly and/or fatal consequences. 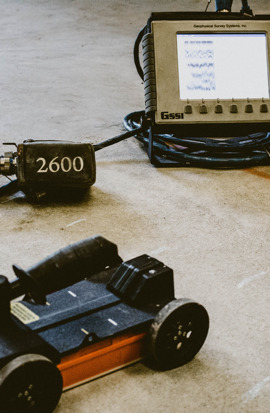 Utility Survey Corp. provides underground utility locating services using state-of- art technologies such as ground penetrating radar as well as conventional cable/pipe locators. In special occasions, we also utilize other geophysical scanning tools such as electromagnetic induction instruments. We have the technologies to locate both metallic and non-metallic utilities including PVC pipes and fiber optic cables. 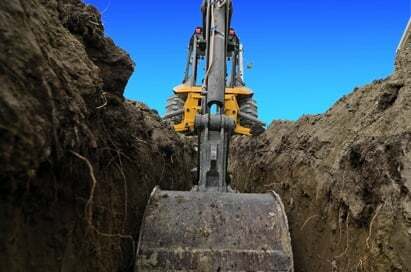 If you need to identify underground utilities on site for your drilling, excavation or building project, we have well-trained utility locating specialists to help you. Our specialists have the critical skills in underground utility designating, which is one of (if not the most) technically challenging components in subsurface utility engineering. Even you have as-built plans, be aware that they might be outdated! In most cases, calling 811 (One-Call) to schedule a public utility markout is only the minimal requirement for utility damage prevention. One-Call doesn’t mark all utilities and it doesn’t necessarily cover areas outside of the public utility jurisdiction. Utility Survey Corp. provides comprehensive private underground utility locating services for additional safety measures. We locate both evident and non-evident utilities including but not limited to electrical power, telecommunication, water, natural gas, sanitary sewer and storm drain. We also specialize in utility locating in high risk areas including oil refineries, gas stations, substations, power plants, etc. Through years of experiences, Utility Survey Corp. has developed an efficient operation system including its unique and proprietary “10-Step Utility Locating Protocol™” to minimize risks for our clients. This field operation protocol is especially important for trenching and excavation projects, which are generally much riskier than drilling projects. Our scheduling policy also follows the risk-minimizing principle by ensuring that our field operators are not rushed to skip protocol steps to finish projects. In addition, we have an emergency plan for our clients’ locating needs in weekends, often for unexpected encountering of underground utilities. We locate not only utilities underground, but also those underwater and embedded in concrete structures. GPS positioning and AutoCAD mapping of the utilities can also be provided if needed. In addition, we provide non-destructive geophysical survey services for locating other subsurface features such as underground storage tanks as well for your ground-breaking projects. Big or small, every utility locating project is unique. Give us a call and discuss your utility locating needs! Unlike X-Ray, the typical EM radiation from GPR is less than what a cell phone emits. No special cautions or business interruptions are required. Can you locate electrical conduits made of PVC? While it’s easier to locate steel and other metallic conduits, we do locate PVC conduits as well. For locating electrical conduits, we use GPR as well as pipe/cable locators to minimize the risk. Can you locate utilities below the concrete slab? We locate utilities embedded in the concrete as well as those below the concrete slab. What makes you different from other GPR concrete scanning companies? All of our technicians are trained to follow our proprietary "10-Step Concrete Structure Scanning Protocol™". It has been tested on numerous projects, refined where required, and have successfully proven to minimize the potential for utility strikes. All this brings to our clients a service we believe is second to none. And - we’re very proud of that. Find out more about the Power of GPR in our GPR Information Guide, including a picture of an actual GPR image. Check out our 10-Step Utility Locating Protocol™" to learn what we do for you! Check out our "10-Step Concrete Structure Protocol™" to learn what we do for you! 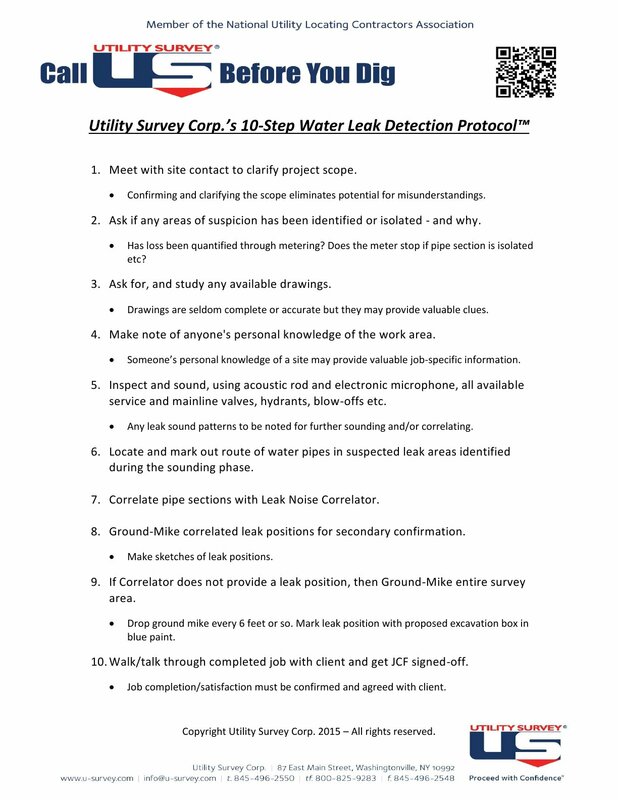 Find out more about the methodology used in our 10-Step Profiler Protocol™"
Utility Survey Corp.’s 10-Step Water Leak Detection Protocol™ will answer your questions! Stay up to date with our latest strategies and technologies.